Gone Home is a game about revisiting a past you can’t really revisit. It feels like when you’re all grown up and you’re standing in the same yard you grew up in and you reach out and almost, but not quite, reach yourself, decades ago. 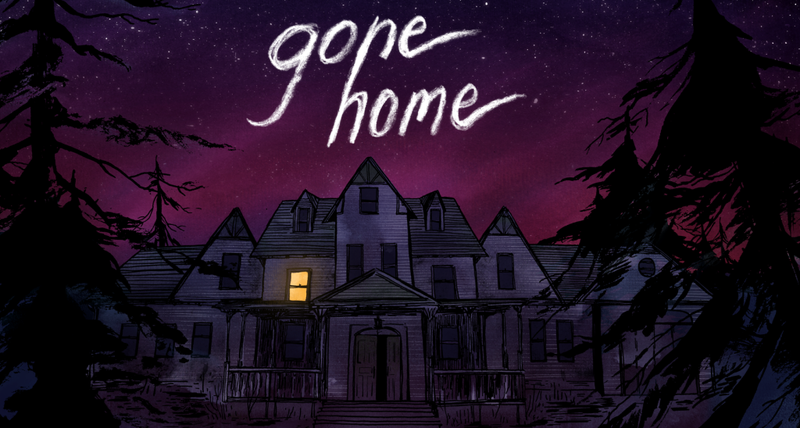 Gone Home is a game where you arrive home from a year abroad, only to find your house empty. Where is your family? What’s going on? You can’t really talk about the game beyond this without spoiling the experience. It’s only around one hundred minutes long and if you’re at all intrigued, you should play it instead of read about it. I usually consider videogames immune to spoilers as their stories are so often simply not worth caring about, but in this case: spoilers from here on. Gone Home’s most superficial success lies in its environmental, or world, storytelling. You do not engage in dialogue nor make dramatic choices in the heat of a tense moment. It’s all in the details. What you’re doing is exploring the house and uncovering details, and all that you’re witnessing tells the story. Or stories, plural. Gone Home’s environmental storytelling is leagues beyond what we’ve become to mean by it. Half-Life 2 was a giant in this playground for a long time, but its splashes of blood and scrawled graffiti now seem trivial in comparison. (That Lambda symbol is still genius, though.) Simply by witnessing their everyday environment, you put together a dramatic, compelling picture of this (your) family and the people involved. This sort of storytelling means audio recordings. I hate audio recordings. They never work in the fiction and it’s tedious to wait through the “color” bits to get the clues to open the safes and doors. They’re lazy. Gone Home is audio recordings done right. There’s two kinds. One is your sister, Sam, talking to you as if in a letter, at key points during the story. They’re not explained, they just sort of overlay the narrative, much like a movie narrator. It doesn’t make sense, initially, but it’s all brought together beautifully in the end. The second kind is tapes (C-cassettes!) in the game world. Whereas you have to stretch your sense of disbelief a lot in most games to accept the audio messages, unlikely as they are, here they are mixtapes left by one teenager to another. If you ever were a teenager in the 90s, you very likely did this yourself. They don’t contain nonsensical messages, they contain music, reinforcing the story and the time and the place. When you find one, it’s useless before you find a cassette player (which are always at hand). Just this act of taking the object to the player and playing it back grounds it. You’ve done this countless times in the real life, turned a cassette around in your hand to deduce what might be on it and playing it back by pressing a satisfyingly clunky mechanical button on a deck. To be fair, all the written material, moody and scene-setting as it is, is a bit of a crutch. It’s too conveniently laid out and chronologically ordered, and while the mid-90s explains why they’re writing things down in the first place (instead of typing it on Facebook), this dysfunctional family is really bad at leaving evidence of their doubts and transgressions lying around for anyone to see. But you accept it all for it is a game, after all. Gone Home has exceptional characters. The family feels like your own and the characters, especially Sam, the protagonist (not you), becomes someone you want to hang out with. Much like a good movie or book, then, but that never happens in games! As the story races to its completion, you start to really care for them and want the best for them. There is genuine worry about their fate, far transcending the horror game tropes the game – misleadingly – starts you on. It is character building without ever meeting the characters. Any game writer should study this as a case of building characters and player interest in them. Speaking of characters, there is an escalating, deeply personal drama here, without any character interaction or conflict in place. None. Yet it wouldn’t really work as non-interactive fiction, either – the player’s presence and agency is required for the story to work, but puzzlingly his input isn’t required. On paper it doesn’t sound like it should work at all, but it does. The story is completely reliant on the player caring and letting the story take place between the lines, in his own head. That’s a massive leap of faith, really, but one Gone Home works on building up to, all of the way. The game is essentially only playable once. Its reliance on playing with the player’s expectations veers close to being a gimmick, but arguably just avoids it. They’re trading on the gothic horror cliches and videogame vocabulary to make the player except ghosts and demons – and monsters of a more mundane kind, as well. At the very least you expect a sad outcome – I know I had a suicide in mind at the end – but the emotion they’ve built up in you carries it through. You’re so relieved at the conclusion that you don’t mind the smoke and mirrors. It was all for a good cause, after all – that smile on your lips. Gone Home does the micro meaning better than any game before it. When Heavy Rain proved that you could make a Hollywood thriller work without all the gunplay and fantasy cliches in a videogame, it was still relying on serial killers and weird dreams. It took you far out of the ordinary. Here the power of the mundane proves far more effective. The sense of place and time are meaningful. You are in this house, inhabited by this family, and it’s taking place in 1995. The world is not filled with incidental details – all the details are there to support the story. It’s a case of game – or rather narrative – design dictating visual design. They evoke the time with powerful details you had no idea you recall anymore, things like how the tape box hinges work and what’s the packaging of various items like. Nirvana and the X-Files on the walls of a teenager’s room. I was born in 1978 and Gone Home often feels like visiting the houses of my friends in the late 80s and early 90s – and sometimes also like revisiting home. I didn’t know many girls at the time, and the feeling of trespassing on a teenage girl’s territory and thoughts in the game makes a powerful connection to my younger self. I shouldn’t be here, but it’s very interesting. What is Sam thinking about? What drives her? What does she want? It’s easy to liken Gone Home to a movie, with its grown-up, mundane story with scarce videogame trappings and its length of barely two hours. But this is a game experience and like the best games, it only works as a game. Even though you engage in very few mechanics and you could argue that there are no meaningful choices in the game, it’s all a big meaningful choice. The game doesn’t exist without interacting with you – your youth, your childhood, your teenage hopes, dreams and struggles. If you start to take apart the story or the mechanics, it all unravels. But if you’ve connected with it, like any art, it proves impregnable to corruption or doubt.